Having an open chimney is like leaving your window open all the time. Fitting a Chimney Balloon to an open chimney is like fitting the gap with double glazing. The Chimney Balloon is designed to inflate and push against all four walls of the chimney, holding itself firmly in place. There is a small vent in the side of the product which allows some airflow, permitting your chimney to “breathe”. The rubber bands hold the top and bottom together, enabling it to push outwards as it’s inflated. Being stretchy, they allow far greater range of flex than some other inflatable chimney draught excluders with inflexible central cores. This means each size will fit a greater range of chimneys. However chimneys do vary a lot so it is worth taking the time to measure yours carefully before selecting the appropriate size balloon. Being effectively a double barrier with the top and bottom of the balloon, air is trapped inside, insulating the chimney against cold air sinking down, while simultaneously preventing warm air from rising up. 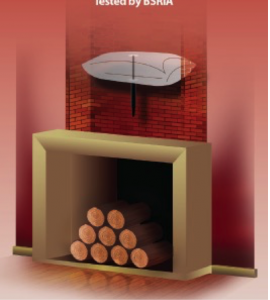 Fitting a chimney draught stopper like the Chimney Balloon stops the stack effect created by a chimney syphoning all your expensively heated air out of your home. The balloon also insulates against sound, prevents debris and wildlife from falling in, and reduces weather ingress.